We abhor war and violence. It's part of why we left the U.S. years ago. We find America's wars of aggression to be embarrassing and we strongly oppose them. But when my teenage son heard through the grapevine (his mother) that there is a shooting range open to tourists in Phnom Penh where you can shoot AK-47s, M-16s, and even rocket launchers, cooling his curiosity became an hourly battle. Bohemian Mom, who has forever banned guns from our household even if there's a zombie apocalypse, was dead set against the idea leading up to our trip to Phnom Penh. So she took some convincing. She is adamantly anti-gun, but she's also a full-blown experience junkie. 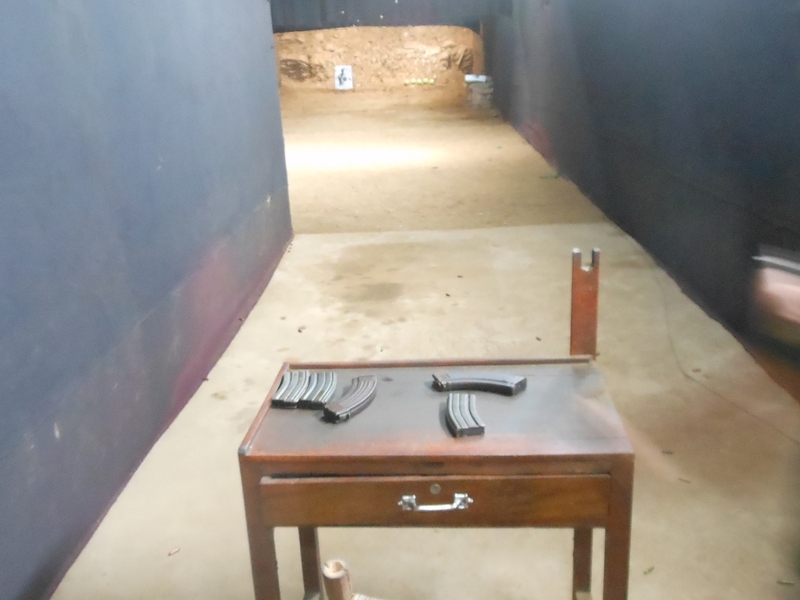 Although a shooting range is not something we would ever normally seek out for thrills, the opportunity seemed too interesting to pass up. Even though we are peaceniks to the bone, we also possess a strong survivalist instinct. We believe having a certain level of self-sufficiency is one of the best forms of wealth in uncertain times. In fact, one of the most difficult aspects of leaving our more stationary life in Costa Rica was giving up our four fruit-filled acres, egg-laying chickens, and other local fresh food. My point is, there's something about learning how to properly handle a firearm that fits our survivalist urges. And, as homeschoolers, it presented a chance to teach the kids something I couldn't offer them without this very unique opportunity. After about a 30-minute tuk tuk ride through rapidly developing area of Phnom Penh just past the airport, we arrived at the "Army" firing range. $350 for the rocket launcher...and so on. The boys salivated like they were standing over an all-you-can-eat buffet. 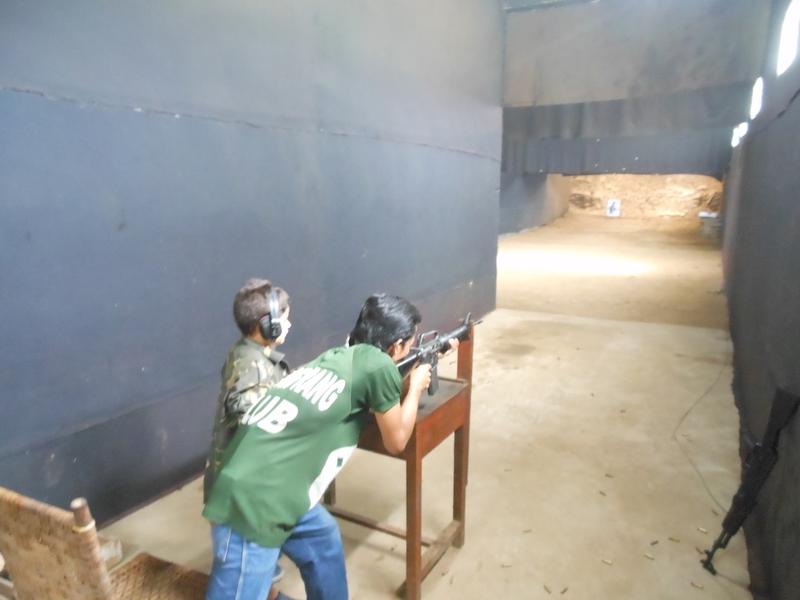 As I tried to temper the appetite of my 8-year-old because I thought surely he was too young to participate, the host said the M-16 is "no problem for him." Somewhat dumbfounded and confused by this, I now had to make a decision of what to order. We settled on the M-16 and AK-47 and I was directed to pay $80 to the shirtless cashier eagerly awaiting our business. We entered a sound-proof room with three shooting lanes separated by walls covered in black felt. Since we were the only ones there, all was quiet until our host made his pitch for us to buy coconuts to use as targets for $1 each. I was suckered into buying 5 for $4. As they set up the juicy targets about 40 meters away, my oldest son's gung ho enthusiasm turned to nervousness as he adjusted his ear muffs and insisted his little brother go first - which he bravely obliged without hesitation. They brought a thick camouflage jacket for him to put on to cushion the impact on his shoulder. The host showed him how to put the magazine into the M-16, load the first round, set the safety, and then how to aim it. 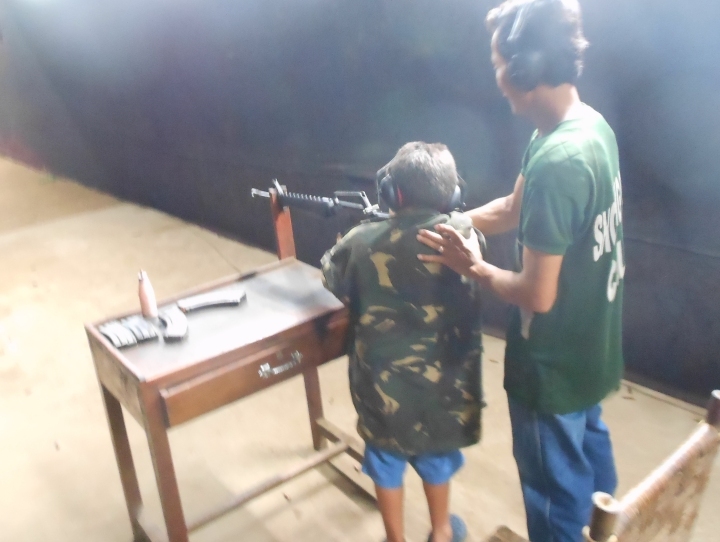 The rifle was set on a table stand which made it easier to handle, and the instructor reinforced his shooting shoulder with his palm. "Boom" the first shot fired which was shockingly loud even with the ear muffs on. This made the older one even more nervous. As he squeezed off nine more rounds, we became accustomed to the noise and D reluctantly took his turn. His second shot was a direct hit on a coconut which exploded into a thousand pieces enticing a confident smile from him and cheers from us. 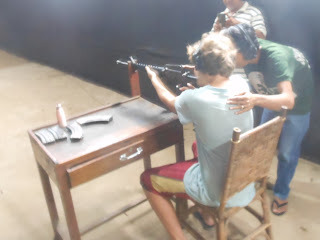 I was up next on the AK-47. Until this moment, my only shooting experience was with an air rifle and a 22 when I was in my teens. The host inserted the banana clip of 25 bullets, cocked the first round into the chamber, and showed me how to use the safety, fully automatic, and semi automatic settings. I had 25 rounds to shoot four lousy coconuts. How many did I hit? Zero. After each shot, my host politely said "a little higher, sir" or "the target's a little lower, sir", but I was more consumed by the sensation than the target. The AK-47 is a solid gun, comfortable to grip, and has a surprisingly manageable weight. When fired, you definitely feel the power of the weapon but, again, it's surprisingly manageable. Yet, shooting it did not relieve stress in me like so many others claim. I tried to get D to take over the last dozen rounds, but he seemed a bit spooked by it all. From start to finish, we probably spent about 8 minutes in the shooting range. So, about $10/minute. Was it worth it? Yes, but not for the reasons we initially thought. Mom was nervous the boys would like it so much that they become gun nuts. But it wasn't like the arcade games, and they actually seemed a bit turned off by the realness from the jolting power of the loud shots. They may have been cured of their gun fantasies spurred by being heroes in video games. Even though it's unlikely we'll go back to a shooting range in the near future, this experience taught us many valuable lessons. Besides learning how to load, handle and fire an assault rifle, we now fully respect that guns are not toys.